John R. Spears was born in Ohio in 1850. 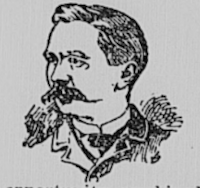 In early life, he worked as editor for a local newspaper, joining the staff of the New York Sun in 1882. As a feature reporter, he was observant and versatile. His assignments covered a wide range of destinations, both in the U.S. and abroad. While much of his later work (from 1895 onward) has appeared in book form, his earlier writings have hitherto remained largely inaccessible. N.B. Articles marked (*) are unsigned, but are believed to be the work of Spears. . . . . . . . . . . EASTERN STATES . . . . . . . . . .
. . . . . . . . . . CENTRAL STATES . . . . . . . . . .
. . . . . . . . . . WESTERN STATES . . . . . . . . . .